With the Conference Finals ready to go tonight, Dirty Dangle previews the four remaining teams to see who their studs and duds are, as well who has been a nice surprise for them. Ryan Kesler has been the top dog for the Canucks. With 5 goals and 10 assists so far he has been the main offensive force, but has maintained his Selke form and ranks 5th out of all players in hits with 42. He was dominant against Nashville and is the Canucks Conn Smyth candidate right now. Christian Ehrhoff has been a rock on D for the Canucks these playoffs and sits 2nd in defence scoring this playoffs with 9 points in 13 games. He is a UFA at the end of the season, so he will be motivated to have a great playoffs and increase his payday in the offseason. Will he resign with the Canucks? The Sedin twins have played OK, but you would expect them to be over a point a game in the playoffs. Daniel has 10 points and Henrik has 9 points in 13 games. The glaring stat is that they are both minus 8. Mikael Samuelsson has one goal in 11 games so far and now appears to be injured for the start of the series. 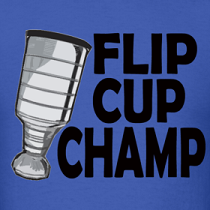 He will have to step up his game if the Canucks hope to be raising the Cup this year. Ryane Clowe has been leading the Sharks in scoring with 13 points in 12 games. After getting rocked by Nik Kronwall and missing a game last series, the Sharks will need him to be healthy to crash Luongo's crease. Fatty, or better known as Kyle Wellwood has shown his critics wrong with a solid playoffs so far. He has 7 points in 13 games and is a plus 7 playing on the Sharks 3rd line. So far Dany Heatley has 3 goals and 8 points in 13 games. The Sharks will need him to start scoring a lot more if they are going to be able to knock off the Canucks. Well if Jeremy Roenick can bash him, I guess we can take a shot at him. Patrick Marleau has 6 points in 13 games, and for a guy making just under $7M a year - that is not going to cut it. Nathan Horton is a Hoss on and off the ice - check out his wife. You know that she is hot when you google his name and "wife" comes up next. He has 10 points in 11 games for the Bruins and already has 2 game winning overtime goals. Brad Marchand is a pest on the ice and the guy with the Pinocchio nose has been putting up the points as well with 5 goals and 11 points in 11 games. Not bad rookie. 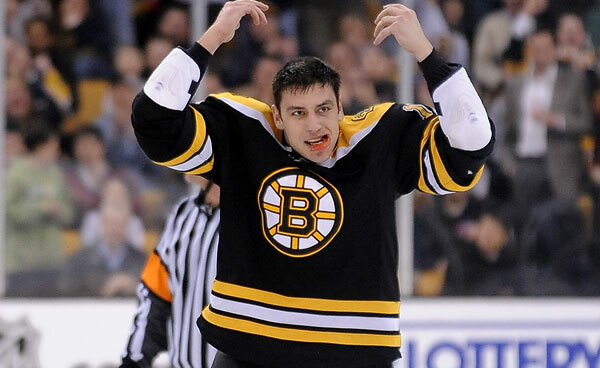 I am scared that Milan Lucic will see this and come kill me in my sleep so I will keep this short. He has 2 goals and 5 points in 11 games. He needs to score more. Tomas Kaberle hasn't been brutal for the Bruins, but he hasn't been great either. He has 3 helpers so far in 11 games and the Bruins are in the Conference Finals. He will get his assists on the powerplay (if the Bruins PP starts clicking), but it's more about what he does without the puck that has Bruins fans scratching their heads. It's hard to pick just one guy for the Lightning since they have had a few step it up big time. Marty St Louis has been a stud with 6 goals and 13 points in 11 games and it's nice to see Vinny Lecavalier playing like the Vinny that led them to a Cup a few years ago. Also, if the Lightning still had Mike Smith and Dan Ellis playing goal there is no way they would have made it this far - Dwayne Roloson has been a solid veteran presence in the crease. Steve Downie has had a great playoffs with 12 points in 10 games, when he is not taking stupid penalties he can be a great offensive threat. Guy Boucher and Steve Yzerman have done a good job keeping this pit bull on a short leash. Steven Stamkos so far has 6 points in 11 games. You wouldn't expect him to be tied for 8th in points on his team, but thanks to his teammates stepping it up his slow playoffs hasn't been that noticeable. No real goats on this team. Closest we can find is Dana Tyrell who has played 4 games and has no points and is a minus 3. While Wellwood might be proving that he still belongs in the NHL, it's Ian White who's quietly playing some of his best hockey in these playoffs. With the exception of one bittersweet game in the Detroit series (one goal, one assist, and a -3), White hasn't had a +/- below zero in 11 games. Sure, he got demolished in his first playoff game but that didn't stop him from picking up four assists in the next two games after he came back from injury. That Marchand link was just awesome. Looking forward to the Canucks game tonight. I was telling my Dad that last month. Sedins have been showing up so far in the 3rd round. Brad Marchand has really impressed me. Could this guy be a 2nd line forward that gets 65pts a year? Canucks are rolling over the Sharks. I thought this would be a much closer series.